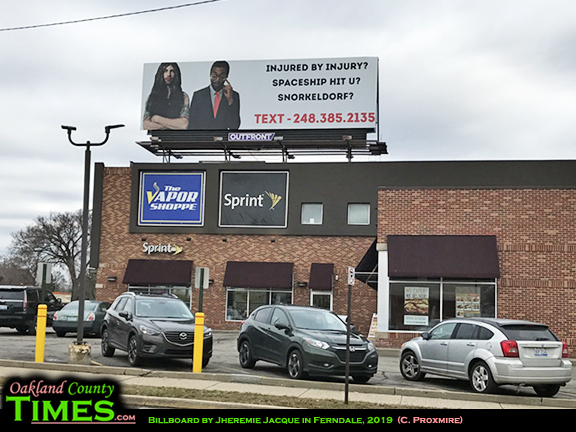 Ferndale, MI- Like many roadways across the county, Woodward Avenue is lined with billboards. As people make their way along such roads, their journey is dotted with images of attorneys promising to fight for their clients. 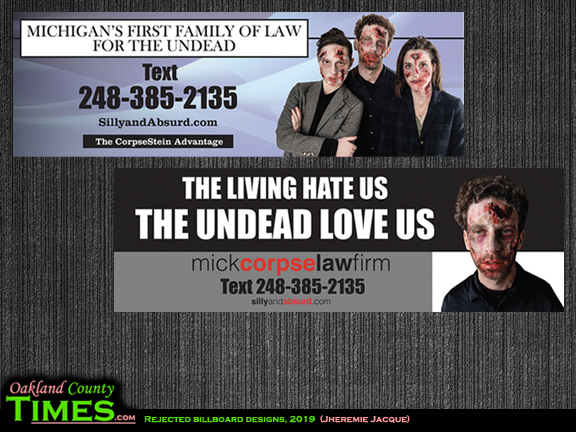 With big personalities, grand settlement numbers, and powerful slogans, attorney billboards have made their way into community conversations and made celebrities out of their creators. The first billboards were put up in the Corktown neighborhood of Detroit. Number one featured Jacques in a powder blue sports jacket on an outer space background. “Questions? Text (248) 385-2135” was all the billboard read. 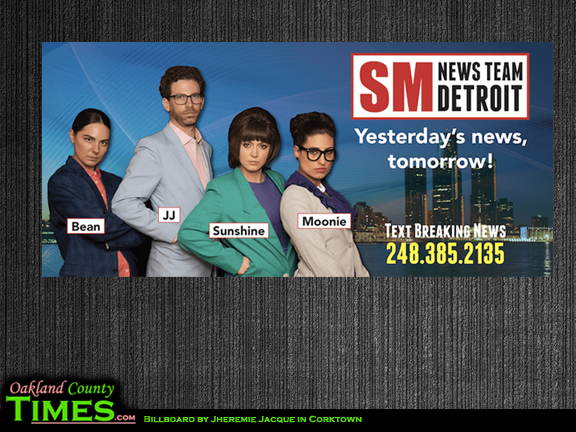 The second featured Jacques and some friends dressed up like a parody News Team, asking the public to text breaking news to the same number. His latest is up on Woodward Avenue and College Street, crowning the Ferndale Sprint Store just about a third a mile south of Nine Mile on the Northbound side. On it are two men. One is white with long hair and tats. The other is a black man in a suit and glasses, who Jacques says resembles attorney Carl Collins, the attorney behind the easy-to-remember phone number 855-CAR-HIT-U. Beside the men’s picture are three questions, along with the same number to text. The number (248) 385-2135 goes to a phone that Jacques bought just for his billboard projects. Those who are sufficiently moved by curiosity text the number with comments or questions. Some days there are over 100 messages. With the first billboard, the meaning of life was among the most common questions. People had questions about love, jobs, religion. Some asked about the weather, or for concierge-type recommendations. One person even texted repeatedly, using two phones to create a days-long story line between two characters and the mysterious “questions” man. Some were just silly. How many licks does it take to get to the center of a Tootsie Pop? How much wood could a woodchuck chuck? Why did the chicken cross the road? In another exchange, Jacques told a worried texter that their Moped “needs more love and positive reinforcement,” and that their 10mm sockets were hiding. “They will reveal themselves when the time comes for them to fulfill their destiny,” he texted. 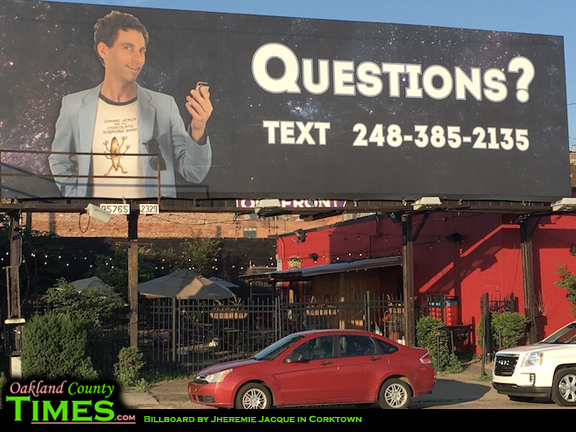 With the billboard in Ferndale, the Spaceship Hit U gets chuckles from those who get the Carl Collins reference, but it’s Snorkeldorf that really piques people’s interest. The word was just a nonsense word in Jacque’s mind. But when the billboard company wanted to know more about the definition – to make sure it was nothing offensive – he found that Snorkeldorf was a character in the 1970s kids’ cereal Freakies and remembered something from his childhood. “I won a Snorkeldorf patch in Kindergarten,” he said. Some people skip past the fun possibilities and ask what Jacques is up to. Jacques currently works at a nonprofit in LA. but considers Metro Detroit home. He’s not wealthy. And billboard space is not cheap. (“$900 was the cheapest for 28 days,” he said). Yet to Jacques it’s an “absolutely” worthwhile expense. Jacques has a degree in advertising and a habit of being extra observant of the advertising that he comes across in his day to day life. He’s also in the bands Rainbow Room and Zombie Jesus and the Chocolate Sunshine Band. From behind the curtain of electronic anonymity, his focus is on spreading smiles. One gentleman texted Jacques asking “What should me and my wife do this weekend?” His reply was to suggest a strolling four course meal, with each course at a different restaurant. He also advised them to write down three things they liked about each other, and share the notes during dessert. While the experience has been overwhelmingly positive, there is a part that Jacques finds frustrating. “You can’t just put whatever you want on a billboard,” he said. He had originally wanted to focus on attorney ads, but the concept was rejected so he went with the “Questions?” design. More recently a billboard company agreed to let him use the image currently up on Woodward, yet there are two other designs they continue to reject. “I think humor and parody are important parts of our society. I’m disappointed they don’t see it that way,” Jacques said. He considers the denial censorship, however billboard companies do have the right to reject ads at their discretion. The plan, Jacques said, is to start placing billboards in random places. “Big cities, middle of nowhere towns. Anywhere that has foot traffic so people can text,” he said. “I want to see the different response I get.” He says he’ll keep trying with the zombie spoofs.